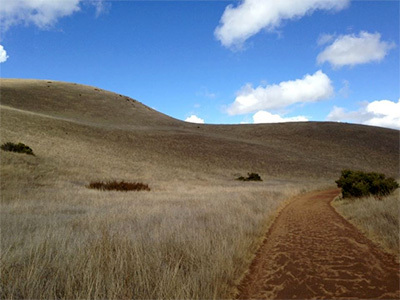 Tam Hiking Tours offers featured hikes on Mt Tamalpais (and surrounding areas) 4 days a week. Dates and times are subject to change depending on the season. See our calendar for this month’s fixed schedule. Don't like booking online? to schedule your hike. (415) 888-2474. Tam Hiking Tours offers personalized tours for individuals, groups, and schools 7 days a week. Personalized tours on Mt. Tamalpais (and around) are booked on an individual basis and created especially for your interests, abilities, and time frame. to learn more. (415) 888-2474. Skill level: Moderate. Should be comfortable on steep singletrack trails with occasional stream crossings, weather and water flow permitting. Trail/hiking shoes recommended. Special considerations: Dogs must be leashed for segments of this tour. From the West Blithedale Gate in Mill Valley, we meander along picturesque Old Railroad Grade Fire Road to Corte Madera Creek Trail - a singletrack trail resplendent with canopies of tall Redwoods, Oak and Bay trees, and elegant ferns settled near the creek’s edge. Corte Madera Trail provides us with the elevation gain needed to make our way to the ridge top. At the end of Corte Madera Creek Trail we select either Hoo-Koo-E-Koo Road or Hoo-Koo-E-Koo Trail (which features Echo Rock) to complete the last leg up to Blithedale Ridge Fire Road, commonly referred to as the Roller Coaster. We continue eastward to enjoy spectacular panoramas in all directions. Blithedale Ridge offers what many consider to be the most spectacular views of Mount Tamalpais, as well as fabulous vistas of Mill Valley and Richardson Bay, Corte Madera, Larkspur, Ross, San Anselmo and Bald Hill, Mount Diablo and the East Bay, and San Francisco, which when viewed from this perspective brings to mind the Emerald City in the movie classic, The Wizard of Oz. Special considerations: Dogs are not allowed in Tennessee Valley. Regular walking shoes are adequate for the main road. Trail/hiking shoes recommended for all other trails. A lovely walk to Tennessee Valley Beach along a level road flanked by rolling hills and ocean bluffs clothed in a changing variety of hues, depending on the season; shimmering emerald green in the winter, lush green native grasses with blue lupine, orange poppy, yellow buttercup, pink checker bloom, blue eyed grass and other bright wildflowers in the spring, and in the summer and fall, muted blends of brown, gold and green mixed with monkey flower, fennel and sagebrush. Fresh ocean breezes, and often coastal fog, spill into Tennessee Valley pulled by warm inland air. This combination of ocean brine mixed with eucalyptus and sage is both intoxicating and invigorating. This tour is for those who desire a more vigorous hike. The payoff is well worth the effort. Spectacular ocean and city panoramas emerge almost immediately as we hike to the top of Fox Trail where it intersects with the Coastal Trail. On clear days the Farallon Islands are clearly visible 30 miles off shore, while Mt. Tamalpais and Pt. Reyes Peninsula reside to the North. Prepare to see wildlife of many kinds, hear the faraway sounds of ships and foghorns, and breath in the heavenly scent of cool ocean air and coastal sage. No day is the same on this spectacular trail. Skill level: Moderate –strenuous. Should be comfortable on steep singletrack trails with occasional stream crossings, weather and water flow permitting. Trail/hiking shoes recommended. 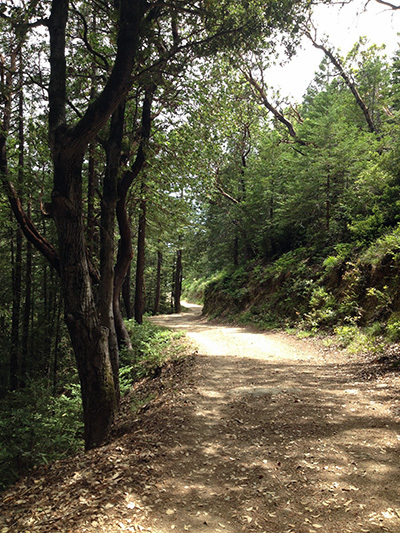 Special considerations: Hoo-Koo-E-Koo Fire Road is utilized by mountain biking enthusiasts and has many blind curves. Dogs must be leashed during segments of this tour. From the West Blithedale Gate in Mill Valley we follow the Old Railroad Grade Fire Road up steep Corte Madera Creek Trail to Hoo-Koo-E-Koo Road. We turn south onto relatively level Hoo-Koo-E-Koo Road for approximately 1.5 miles to enjoy absolutely breathtaking views of the Pacific Ocean and the surrounding Bay Area including beautiful Sausalito, San Francisco, Mt. Diablo and the East Bay, and the east peak of Mt.Tamalpais. As we make our way back we either continue on the Hoo-Koo-E-Koo Road to where it feeds into Fern Canyon Road or step down Temelpa stairs to a singletrack trail to that feeds into Fern Canyon Road. There we select either the Old Railroad Grade or choose from a variety of quaint Mill Valley residential streets all of which bring us back to W. Blithedale Gate. Skill level: Mostly moderate to mild, with a short segment of more strenuous elevation gain. Should be comfortable on steep single-track trails. Hiking or trail shoes recommended. Does meandering through a redwood, bay and alder forest, crossing bubbling creeks and streams on rustic wooden bridges, while making your way toward a classic old hiking lodge sound good to you? If so, you’ll love our Matt Davis Trail to the West Point Inn Tour. 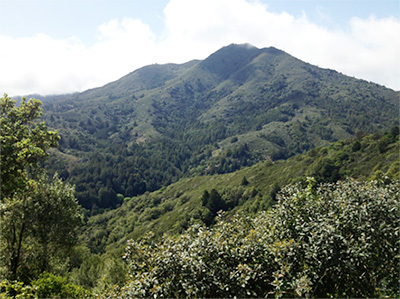 On this tour we experience many of Mt Tam’s microclimates as we scale along the southwestern side of Mt. Tam with the nearby Pacific Ocean as our constant companion. 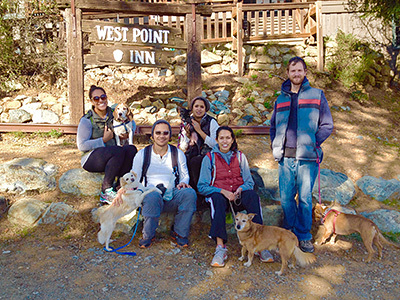 Midway we stop to refresh and explore the historic West Point Inn while soaking in some of the most fulfilling views Mt. Tam has to offer. We make our way back along the very same route traveled by the old Scenic Railroad during the turn of the 20th century. What makes this hiking tour especially pleasant is the mostly moderate elevation gain and a nicely varied landscape. You don’t have to be a marathoner to enjoy a truly spectacular experience. Please note: On this tour we meet near the trailhead so personal transportation is required. Please contact us for special arrangements. Skill level: Because this tour is customized, skill levels will vary. Special considerations: Trail/hiking shoes recommended. Leashes and dog waivers required. Please bring water for your pet. It’s awesome to see a great big happy smile on the mug of your “best friend” and a mountain walk is just the place to assure that happens. For this reason we invite dog lovers to enjoy our dog focused hiking tour where pups can sniff and romp to their hearts content. Leashing may be required at times. Contact Tam Hiking Tours to learn more about our dog-friendly hiking tours. Skill level: Easy-Moderate. This hike is less difficult than some of our steeper hikes, with only occasional elevation gains. A short segment of the tour is singletrack. Trail/hiking shoes recommended. 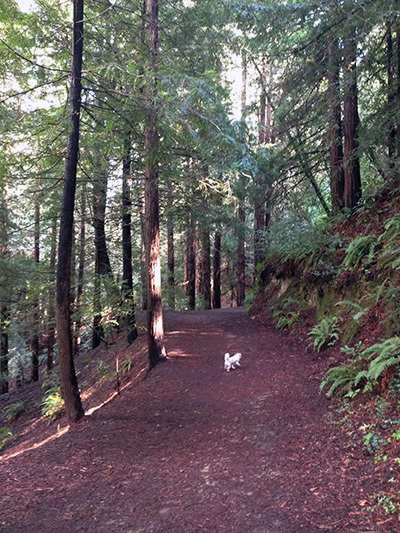 Elinor Fire Road is a dog walker’s dream and one of my favorite hikes. On this tour we meander through Warner Canyon, along softly padded paths of pine needles under canopies of Redwood trees, as we make our way up to Blithedale Ridge. There we are welcomed by truly spectacular vistas of Mount Tamalpais and the Bay Area. On the east end of Blithedale Ridge we make use of a singletrack trail as we head back down to our starting point. Special considerations: This hike includes steep uneven stairs with significant elevation gain up to Tenderfoot Trail, where narrow and uneven terrain is expected in some areas. Trail/hiking shoes recommended. Dogs must be leashed at times. This tour starts and stops at the foot of the infamous Dipsea Stairs, near Mill Valley library. 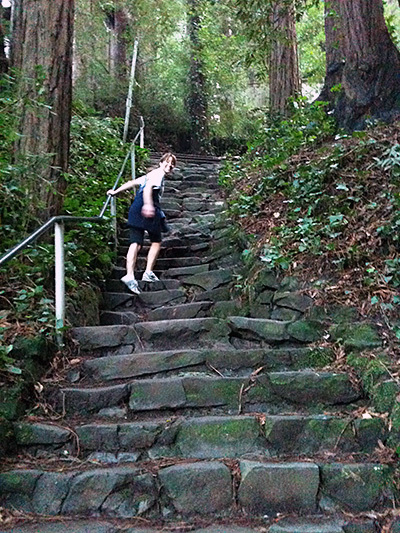 We make our way up circuitous stairways nestled in Redwood groves, passing terraced vintage homes and secret gardens. We take a few deep breaths on top of the ridge while also savoring the view. We press on to the elusive Tenderfoot Trail with an ambience of forest woodlands, filled with coastal mists, mountain springs, and softly chirping birds. Canopies of trees provide delicious shade during warm summer months. Cascade Creek greets us at the bottom of Tenderfoot Trail and leads us back to where we began, on a wavering path through the fern-lined streets of lushly verdant Cascade Canyon, with a brief stop at Cascade Falls. Skill level: Moderate to strenuous. There is an elevation gain of 1,141 ft. on dirt road or wide trail. Special considerations: Dogs must be leashed at times. Coyotes and other wild life abound. Trail/hiking shoes recommended. Directions to Bald Hill will be provided. Most of our tours focus on the southeastern side of Mt. Tam’s East peak. Bald Hill is located directly north of East Peak, (near the city of Ross) and offers a different terrain from the heavily wooded regions near Mill Valley. We amble past Phoenix Lake’s shimmering waters as we make our way up to grass-covered hills featuring expansive vistas in all directions. Coyotes and deer are often spotted on this tour. Skill level: Single track and Fire Road. Moderate elevation gain with short sections of strenuous hiking and long sections of easy. Total elevation gain ~1000ft. Special considerations: Trail/hiking shoes recommended. Dogs are not allowed on this tour. Ocean breezes can be “refreshing” even on warm days. Come prepared with extra clothing. 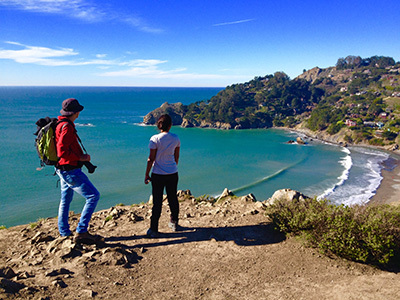 The Muir Beach tour offers panoramas of the tiny hamlet town of Muir Beach, the Pacific Ocean, Farallon Islands, and Mt. Tamalpais. We begin at Muir Beach parking lot, located ~ 7.5 miles from Mill Valley. From the main lot we follow the Coastal Trail up to Coyote Ridge, where it intersects with Fox Trail, overlooking beautiful Tennessee Valley. We return on the Coastal Fire Road to enjoy expansive views of the coastline in both directions. This tour has truly spectacular vistas of the Pacific Ocean and surrounding bluffs covered in native lupine, sage, Manzanita and other coastal chaparral, and an ever changing variety of wildflowers. The particular fragrance of sage and other coastal flora blending with briny ocean air creates an olfactory experience that will haunt you long after the tour is completed. Faraway foghorns and the chirping of birds nested close to the trail produce outdoor music, both moving and soothing. Please contact us directly for special request or personalized tours. This unique package includes water taxi pickup at many piers (both public and private) in the San Francisco, Marin and East Bay area followed by a 2 – 2.5 hour historical hike and delicious picnic on Angel Island. Return water transport includes a viewing of the iconic Golden Gate Bridge. Call Tam Hiking Tours (415.888.2474) for more information and to book. Hiking Time: ~ Hiking times vary. Please contact TAM Hiking Tours (415.888.2474) and Urban Hiker SF (415.669.4453) to choose a time. Enjoy San Francisco by sea and by land! With the Surf & Turf package you get a Bay Cruise with Adventure Cat Sailing Charters, and then a choice of two unique local guided hikes. Choose from hiking the quiet and view-filled natural landscapes of Mt. Tamalpais, with TAM Hiking Tours. Alternatively, you can explore the urban landscape with Urban Hiker SF, discovering sights and scenes that the average tour never reaches. By the time it’s all over you’ll know more about SF than a local! Call Tam Hiking Tours (415.888.2474) for more information and to book. $100.00 per person (includes one city and one country hiking tour). 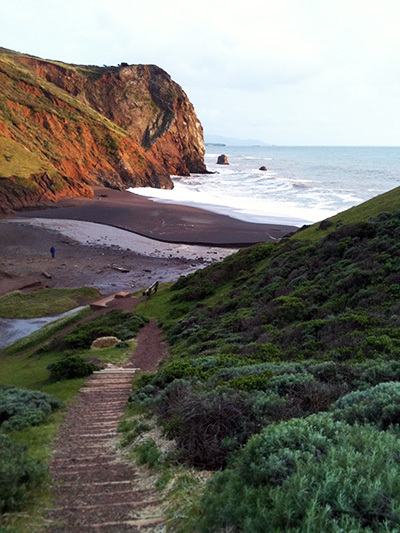 Hike the best trails on both sides of the Golden Gate Bridge! 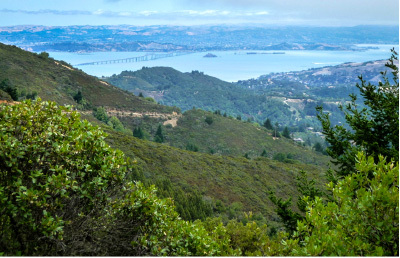 With our Turf & Turf package, you get a hike in Marin County with Tam Hiking Tours and a hike in the city with Urban Hiker SF. 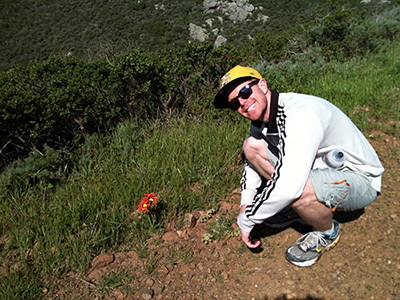 To book: Book your Tam Hiking Tours hike and choose the Urban Hiker SF add on. You can also , or call 415.888.2474. We'll connect you with Urban Hiker SF to arrange your tour. Hiking Time: ~ 2 - 3.5 hours, depending on the hike. Skill level: Be prepared for a variety of terrains and abilities, ranging from easy to strenuous. Special considerations: Trail/hiking shoes recommended. Come prepared with extra clothing. For this tour we rotate our featured hikes providing clients the opportunity to become better acquainted with Mt. Tamalpais, while also becoming acquainted with other singles - in a wholesome outdoor environment. Historical and geological information is not provided during this tour. Directions and other info will be provided prior to tour. Hiking time: All walks are ~ 2 miles roundtrip. Special considerations: Trail/hiking shoes recommended. Each rock walk is a specialized adventure. Contact us to create the perfect geology walk just for you. Ever wondered why rocks in the Bay Area look the way they do? Or how they got here and where they’re heading? We certainly do! Marin County is home to some of the most unique and beautiful rock formations in the world. For this reason, and on special request, Ross MacLeod hosts his very popular Rock Walks With Ross Tour, which feature his favorite sites on and around Mount Tamalpais. To participate in a fantastic journey into the Bay Area’s geological past, all one needs is a good pair of walking shoes and an insatiable interest in the story of our planet - as told by the book of rocks - interpreted with great skill and enthusiasm by our favorite rock-head, Ross MacLeod. Ring Mountain: See blueschists, serpentine, thrust faulting, and Native American petroglyphs. Pantoll Ranger Station: Visit the Denos gold mine claim, and the fault that defines Steep Ravine. 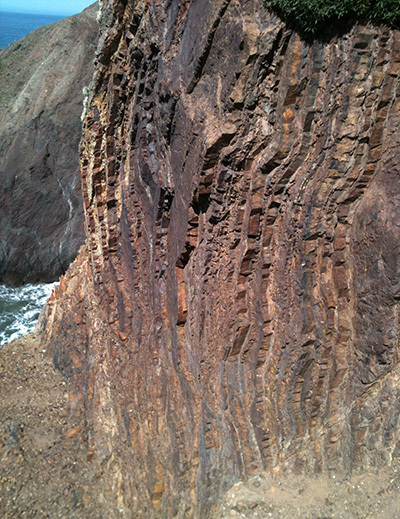 Tennessee Valley: Visit the fault at the base of the Southern Marin Block, discuss Franciscan sandstone, greenstone, Franciscan melange and intact seafloor cherts and basalts. Special considerations: This tour is easily adapted to the needs of the individual or group. May include mild elevation change and some stairs. Fun walks along the streets, alleyways, and hidden stairs of charming Mill Valley, where street reflectors are placed in sometimes bizarre and unusual places. 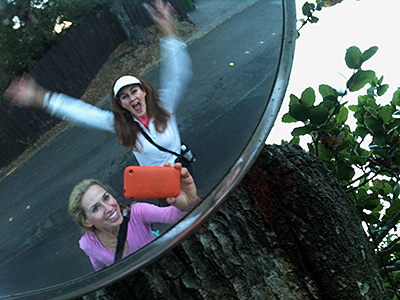 Enjoy the search for silly and fun ways to “artistically” capture your image in street mirrors located at the foot of Mt.Tamalpais. Photographers should be on alert for traveling vehicles, flocks of bicyclists and hikers, forging deer, wild turkey, skunk, fox, and the occasional rock and roll star driving past in a fancy sports car. This hike can be extended to include pit stops in local pubs and cafes. 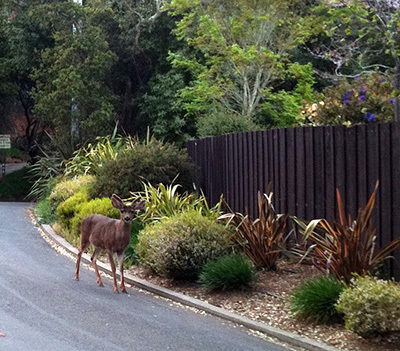 Learn about the streets and neighborhoods of Mill Valley. Locals are invited to join weekly walking groups, or tours, at a special monthly rate. Please contact us for more information. Tam Hiking Tours invites environmentalists, historians, poets, photographers, scientists, teachers, naturalists, and outdoor enthusiasts, to share their knowledge and experiences with the community. Join us for monthly gatherings at Illumigarden in Mill Valley, on a donation basis only. Tam Hiking Tours is interested in new guest speakers, (please contact us to discuss future presentations). Please join us for special hikes. See our calendar for upcoming events. Join walking groups and hiking tours at a monthly rate. Please contact us for details.